Cast: Kim Hee Ae, Ji Jin Hee, Kwak Si Yang, Kim Seul Gi, Jung Soo Young, Lee Soo Min and Park Sung Geun. Kang Min Joo (Kim Hee Ae) is a top TV producer for SBC, famous for making a lot of dramas with great ratings. She is known to always get her way by persuasion and sweet talking her way out of situations. 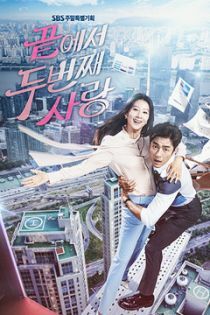 Go Sang Shik (Ji Jin Hee) is a public employee and manager, working for the ‘tourism and environment’ part of his city, where the office works to make get tourists to visit the beautiful parts of the city. He is known to be honest and quite stoic, as well as too cautious and a sucker for rules. When the SBC gets into trouble for copyrighting a story from a webtoonist, Min Joo is put on the spot to fix it, but the artist Go Mi Rye (Kim Seul Gi) refuses to be persuaded, unless Min Joo can persuade her brother. At the same time Min Joo is put in another spot, as the office of ‘tourism and environment’ refuses to let her film the series at the spot she had hoped. Trying to fix this, she gets on the wrong foot with the manager, who happens to be Sang Shik. Budding heads, the two want to avoid each other, but as fate has it Min Rye is the younger sister of Sang Shik, and Min Jo just happened to move next door to Sang Shik, who lives there with his entire family. To make matters worse, Sang Shiks family friend, who is also living with the family, starts to find a liking in Min Joo. This drama is one of the few types of dramas I usually don’t watch, but I guess the older you get your preference ages with you. It is one of those dramas focusing solely on the destiny and love story of the main couple, and while doing that questions several customs society throws at us. Of course, they add in different ages groups to compare those customs, so that the viewer can detect the differences. I remember watching Kim Hee Ae in Mrs. Cop, so I had to see this one, and I did enjoy her acting. I generally enjoyed everyone in this drama since the actors were great. The story was well written, but I gotta say they did ruin a bit of it because of the extra episodes – which was a bit unnecessary. It made the drama longer, and a bit heavier. All in all, a good drama for a mature audience.